Home Articles Which One: Tank, Hybrid, or Tankless Water Heating System? 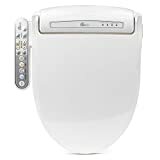 When shopping for an electric bidet seat, one of the first things to note is that they are built with three kinds of water heating systems: tank, hybrid, and tankless. How does each one work? And which one should you get? Each one of these water heating systems has its pros and cons. We’ll tell you all about them so you’ll be equipped with this knowledge when you go out shopping for a bidet seat and you can pick the system that works for you. A tank (or reservoir) water heating system is one that heats water in advance and stores it inside a tank, ready for use when needed. The size of the tank differs between bidet seat models, but generally speaking, the larger the tank, the more warm water it can hold. The tanks should hold enough warm water for a single 30-second wash cycle before needing a few minutes to heat water and fill the tank again. 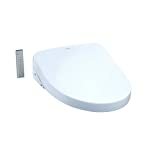 Because a water tank is required with this system, these bidet seats are typically bulky in the back. The most attractive thing about a tank water heating system is zero wait time for warm water. Water comes out immediately warm for the user. These systems also don’t have a huge power draw, unlike on-demand systems, because they heat the water before hand. One major con about a tank water heating system is that you only have access to a limited amount of warm water each time. If you use up the warm water that was stored in the tank, the bidet will use cold water the rest of the wash (or you’ll have to wait a few minutes for water to heat up again). That said, this isn’t a huge problem because the tanks generally have enough water for a 30-second wash cycle – more than enough for a single use. Another major con is that these systems are less energy efficient, since it requires energy to keep the water in the tank warm at all times. To counter this, many manufacturers offer energy-saving modes, but this also means that the water won’t be as warm as in regular mode. A smaller con is that aesthetically, the tank makes the bidet seat look bulky. But then again, bidet seats have come a long way and many bidet seats with tank water heating systems are as compact as ever. A tankless (or instant) water heating system is one that heats water as needed. No tanks, no warm water stored. Another name for tankless water heating system is on-demand or in-line heating system. As water is passed through the bidet seat, it is heated, so that when it sprays out it’s warm. Bidet seats using this system are typically thinner and more compact since they don’t need to make room for a tank at the back. The major advantage of a tankless water heating system is that you have an unlimited amount of warm water. If you need to use the wash for more than 30 seconds, you can count on the tankless water heating system to keep pumping out warm water for as long as you need. You don’t need to resort to cold water or have to wait for water to heat up again. And since everything is “on-demand” you can make temperature adjustments on the go very effectively. Another major advantage is they are more energy efficient because the bidet doesn’t have to use any energy to keep water warm. The one downside with this type of system is you’ll inevitably get a short splash of cold water at the beginning before the water heater kicks in. With most bidet seats these days, the water is heated really fast so the cold spurt won’t last for more than a second, but it’s still a small shock. And because the water heater needs to kick in fast, the power draw is higher with a tankless system. A hybrid water heating system, as the name suggests, uses a hybrid of tank and tankless water heating systems. These systems have a small water tank to hold warm water for the wash, and once that water is all used up, the hybrid system will heat water immediately and refill the tank. The best of both worlds! As you can imagine, there many advantages with a hybrid water heating system as it offers the best of both worlds. From start to finish, you will have warm water at your disposal, and for as long as you need. No cold splash at the beginning like with a tankless system, and no need to wait for warm water again once it’s all used up like a tank system. The bidet seats are neither too bulky since the tank in a hybrid system is smaller than the tank in a tank water heating system. As for cons, it will still have to keep water warm so it’s not as energy efficient as a tankless water heating system, but definitely not as bad. And when it needs to refill the water immediately for the user once the warm water runs out, it will require a large power draw as well.